Happy Wednesday Dare 2B Artzy fans! Hope your week has been spectacular so far. I can’t believe it’s already the first week of August. WOWZA! Where does the time go? It was 7 years ago this week that my hubby and I met for our very first date. It really doesn’t seem like it’s been that long. I guess the old saying time flies when you’re having fun is true. Speaking of fun, I’m back today to share a fun card today. It’s an Acetate Card featuring the Dare 2B Artzy Stamp set Doodle Flowers. This stamp set features 11 beautiful stamps. I confess, I’ve had two packages of acetate for about 6 months and they’ve been untouched until now. I’ve wanted to make a clear card for some time. I’m so glad to be here today to share this unique card making option with you. This card was a lot of trial and error for me. I probably could have save some time if I’d done some research beforehand. I used up 2 pieces of acetate in my experimentation process. Initially I’d planned on heat embossing my images, but that didn’t work due to the static factor with the acetate – the embossing powder stuck to everything. I’d even tried the EK Success powder tool before and also a dryer sheet and I just couldn’t get it to work. More experimentation is needed on that front because I’ve seen people use heat embossing with acetate and it looks beautiful. Next, it was on to inking. I ended up trying 3 different inks that never dried on the acetate before I realized that the only ink that will work on a non-porous surface like acetate is StazOn. I’d only had black StazOn in my stash and I didn’t like the way it went on so I ended up purchasing Cotton White, Teal Blue and Fuchsia Pink to make this card. After two days of my experimentation with embossing powders and inks, I was finally ready to create my card. I started by cutting a piece of acetate to 4 ¼ x 5 1/5 (A2 size). I started off by inking up my StazOn Cotton White ink pad with the ink that came with it. I used my largest Doodle Flower from the set and generously inked the stamp. I placed some white scrap paper underneath my acetate because I found that my craft matt was just too slippery for the acetate. To stamp, I held my acetate pretty firmly with one hand so it didn’t slide around and carefully laid the inked stamp to the acetate being careful not to push it or press the stamp too hard initially because it can slide around on the acetate very, very easily. I found that laying the stamp onto the acetate, then lifting your fingers up and then lightly pressing straight down with one or two fingers on my stamp block worked best. Once I thought the image was inked pretty well, I held the acetate in place and lifted the stamp straight up. Because the ink is sticky you might also have to peel the acetate away from the stamp. I stamped the large Doodle Flower 3 times, stamping off the page to leave the center open and space for other flowers that I’d be stamping. When I went to stamp the smaller flowers from this set, I stumbled upon a happy accident. In my experimentation, I’d tried stamping with the Teal Blue and Fuchsia Pink to see how it looked. Much like the black it smudged a bit and didn’t give a clear impression so I decided that I didn’t like it so much for this project. However, if you’ve ever used StazOn, you know what it’s impossible to clean off your stamps without the actual StazOn Cleaner which I didn’t have any of at the time. I tried cleaning with a non-alcohol brand baby wipe which is my normal go-to cleaner. Although it took some ink off the smaller flowers, it did stain my stamps. Not a big deal though. I’d thought that I’d gotten them clean enough that when I used the white ink it wouldn’t matter. My happy accident turned out that adding the white StazOn ink to the flowers that had previously been stamped with the teal and fuchsia reactivated the ink that was on the stamp and now produced a muted version of those colors. I actually liked the subtle variation so I went with it. I stamped two each of the smaller flowers around the edges. Next I added the small circle stamp and a ladybug to the card front. Once the clear panel was done, I set it aside for a little bit to finish drying in a few places. It dries pretty quickly and you can speed that up by using a heat tool as well. For the back of my card, I cut a panel of black cardstock that was 4 ½ x 5 ½ and scored it at ¼ on the long edge. This would give me a small border to fold over and glue my clear panel to it. Next, I cut a piece of the Dare 2B Artzy Doodle Paper in Wild Orchid down to 4 1/8 x 5 1/8 and glued it down to the inside back of my card to create my pretty purple background which would be seen through the card. Finally, I cut two scalloped ovals in two sizes. The larger one in black and the smaller in white. I stamped the hello sentiment from the Doodle Flower stamp set with some Versamark and heat embossed it with some metallic purple embossing powder. I adhered the two ovals together with some dimensional foam. Using the blank space of my card front to center the ovals, I glued them in place to my background. To add a bit of dimension, I added 3 white enamel dots to my card front. After a bit of trial and error, I ended up with a lovely card. I just love the look of the clear front. Although I didn’t leave much room for a message inside my card, I could add a panel of white to the back for a longer message or I could have used a different layout on the inside that might have given me more room for a message. I hope you’ve enjoyed today’s card. I really enjoyed trying something new and experimenting along the way. This simple but beautiful card will make someone’s day. Thanks for stopping by. 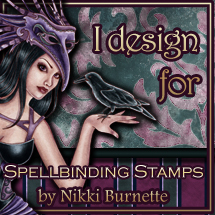 Make sure you check out all of the awesome new stamps and dies in the What’s New Section of the Dare 2B Artzy store. It’s a great time to start planning those holiday cards!